Making New Year’s resolutions is a tradition that I like to uphold. So every year I pick out a few things to work on and keep the list framed by my bedside as a constant reminder. I recently looked back on my resolutions from last year, and I think I did a pretty good job with my 2013 goals. But this year, I was having a harder time coming up with a new set of challenges. 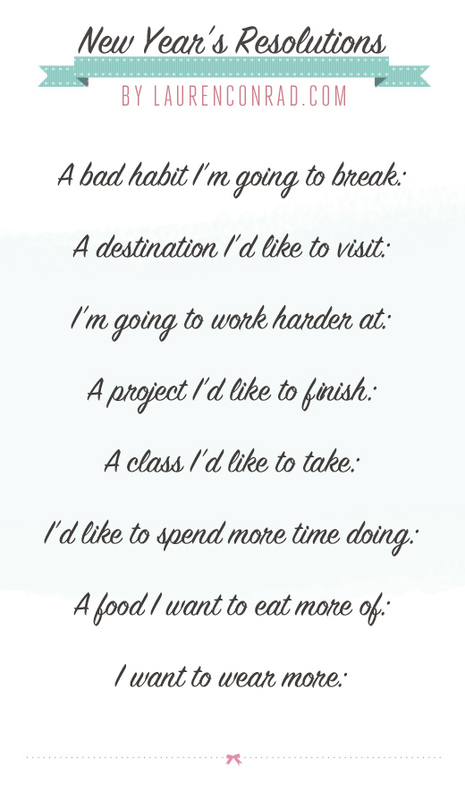 Luckily, I came across a quick questionnaire that helps you decide on your resolutions for the year to come. Check out my answers below. Leaving myself too little time to get ready! Raw fruits and veggies. They’re the easiest and best for me. Fill out the questionnaire yourself in the comments, or print it out and keep it as a reminder. And if you want some extra pointers on making your resolutions last, check out my list of tips.